Our ranges include shackle & spring pins, center bolts, U bolts, collar, castle & check nuts, wheel hub blots and many more. These are made using superior quality materials that are procured from reputed vendors across the globe with zero defects. Clients can avail these products in different dimensions and are tested before dispatching to our clients. They are easy and safe to operate and require low maintenance. These are highly demanded for its features like high tensile strength, optimum quality and high performance. These Shackle & Spring Pins can be adjusted in various vehicles like Mercedes, Tata, Scania, Volvo, Man, DAF, Nissan, Isuzu, etc. These pins are available in various shapes and sizes. 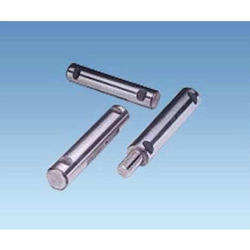 These shackle pins are highly tested on different parameters check the quality of the products. Our wide range of products meets the bulk requirements of the customers and exported at competitive prices. These products are highly durable and offer long service. 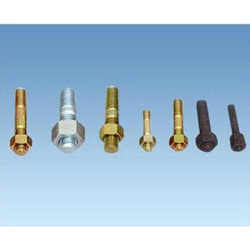 We are among the leading manufacturer and exporter of a wide variety of Metal Studs. These studs are manufactured using premium grade raw material as per the international quality standards and are known for their high performance, sturdy construction and long service life. Our clients can avail these studs to serve different purposes in heavy duty and automotive industry. these studs are available at market leading prices. These are tested on several parameters by our quality inspectors.